The Camp Sumter military prison at Andersonville was one of the largest Confederate military prisons during the Civil War. During the 14 months the prison existed, more than 45,000 Union soldiers were confined here. Of these, almost 13,000 died here. Today, Andersonville National Historic Site is a memorial to all American prisoners of war throughout the nation's history. Today, Andersonville National Historic Site has three distinct components: the former site of Camp Sumter military prison, the Andersonville National Cemetery, and the National Prisoner of War Museum, which opened in 1998 to honor all U.S. prisoners of war in all wars. Visitors today can view restored sections of the stockade and imagine what captivity here might have been like. Museum exhibits tell the story of prisoners of war using artifacts, visuals, text and oral history interviews with former prisoners of war. Two 30-minute introductory films alternate throughout the day. The museum is open from 9 a.m. to 4:30 p.m. daily. A tour road encircles the Andersonville prison site; a self-guided driving tour is available. 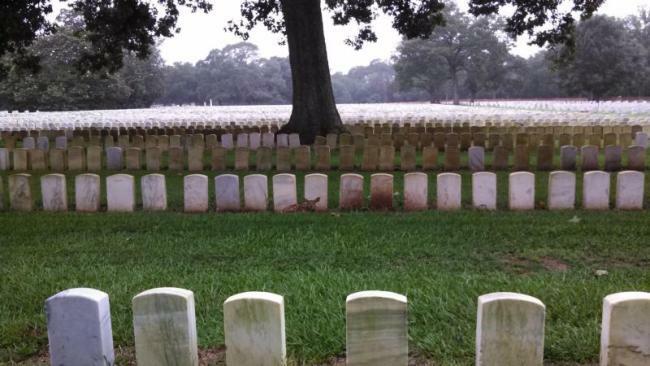 The Andersonville National Cemetery contains the graves of nearly 13,000 Union prisoners of war. The national cemetery is still active and contains over 20,000 interments. Most visitors spend at least two hours in the park. Those with an interest in the Civil War or military history could easily spend most of the day.